Aarhus’ new neighborhood, Lisbjerg, will be built according to sustainable principles and will promote public transport and biking among residents. 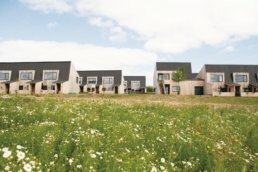 Lisbjerg is an urban development project in which a former field area has been transformed into a residential area, based on sustainable principles. A key objective of the project has been for Aarhus Municipality to demonstrate that sustainable urban development is achievable on market terms. In order to promote circular thinking among residents, as well as in contractors’ choice of materials, the municipality has published inspirational catalogs. The catalogs are now used in all municipality tenders on the Lisbjerg building sites. Plans for the neighborhood are to develop high-density buildings with smart infrastructure, reducing the neighborhood’s CO2 emissions. The project was initiated in 2014. The municipality is planning to establish the neighborhood gradually, over the course of 60 years. Aside from residential homes, Lisbjerg will also be home to commercial buildings, reducing the distance that residents need to travel. The municipality has worked on the development plan over a multi-year time period, involving citizens through various activities including workshops. In the future, citizen participation will be prioritized with the ambition of inspiring residents to support and adopt principles into their everyday lives. All tenders for new building work in Lisbjerg use principles from circular economy, such as in the choice of materials. From its inception, the project has been designed to reduce CO2 emissions by promoting public transport and biking. To achieve this, a light rail and a biking ‘superhighway’ have been established. With its focus on reducing travel distance, ensuring high-density buildings, strengthening local communities and reusing materials, the project promotes the development of sustainable cities in several ways. Increasing responsible consumption and production are key focus areas, as principles from circular economy are introduced and integrated at both contractor and resident level.